Hello, everyone! This semester, I am writing a series of blog posts about the effects of ocean acidification on coral reefs. If you are unfamiliar with the concept of ocean acidification, please check out my last blog post, “When Air Meets Water: Carbon Dioxide And Ocean Acidification.” You will find an explanation of the ocean acidification process and an examination of the negative relationship between atmospheric carbon dioxide and calcium carbonate concentrations. 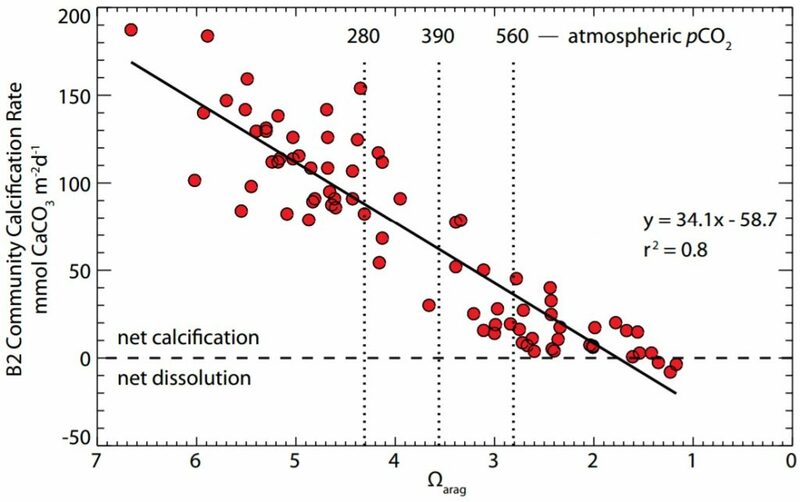 Furthermore, the post shares projections for atmospheric carbon dioxide concentration, oceanic pH, and calcification rates, as well as describes how ocean acidification lowers aragonite (calcium carbonate) saturation and threatens reef building and reef organisms. As mentioned previously, ocean acidification can alter ecosystem dynamics and reduce reef diversity. Figure 2 illustrates relationships between pH, algal cover, and species abundance that were determined using a volcanic carbon dioxide vent system. 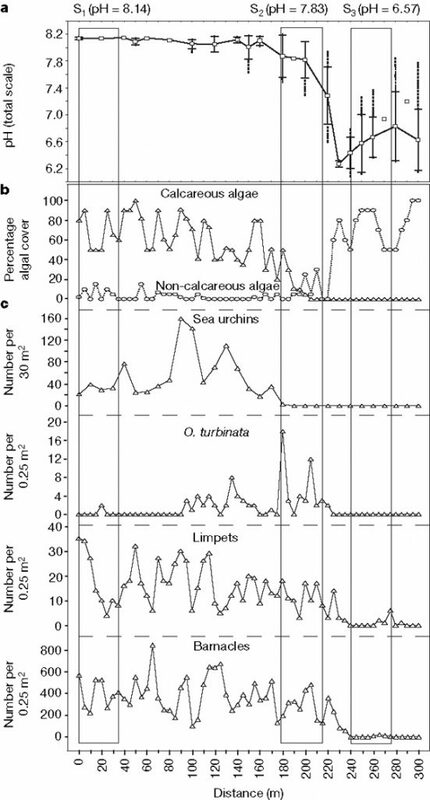 In Figure 2B, as pH drops, non-calcareous algae overtakes calcareous algae in cover dominance. In Figure 2C, sea urchins, which help maintain ecosystem complexity and stability,4 disappeared first (pH = 7.4-7.5) as the pH dropped. On the other hand, calcitic organisms like barnacles, which can close their rostral plates around supplies of ambient water,4 survived until pH dropped to 6.6. Finally, under pH 7.4, adult Opuntia turbinata and limpet gastropod shells are weakened, increasing risk of predation,3 as evidenced by the drop in gastropod abundance. Kleypas, Joan A., et al. “Impacts of ocean acidification on coral reefs and other marine calcifiers: a guide for future research.” Report of a workshop held. Vol. 18. 2005. This entry was posted in Uncategorized and tagged 2017, Amber, aragonite, calcification, calcium carbonate, Ocean Acidification, reef organisms. Bookmark the permalink.